A village WWII veteran shares a tale of amazing coincidence. In our September issue, we printed a letter from Lickey End resident Les “Ozz” Oswin, who told us about his father’s naval service in the First World War. Les, who celebrated his 93rd birthday last month, has also shared with us some of his own wartime memories from World War II. Les was born in Portsmouth, the second of three sons. His father’s naval career saw the family move to Greenock near Glasgow, then Market Harborough, then to Leicester where the boys were educated. Called up into the Royal Corps of Signals in June 1942, Les was undergoing training on the Isle of Man when he heard about the D-Day landings, not knowing that his elder brother had landed on Juno Beach, later losing an arm in Belgium. “All of us who were in the Services during WWII have so many memories – in my case I was one of many who were fortunate not to have become involved in actually “fighting the enemy”, though we were ready to do so if required,” Les continues. “Back in 1945, being a big band fan, I heard on the BBC Light Programme a record which took my fancy. “Shortly afterwards, in the Indian Ocean on board the Monarch of Bermuda, a luxury liner converted to troopship, I decided to write to the BBC for this particular record to be played for me on one of the Forces Request programmes for troops overseas. “On arrival in Bombay in mid-February, my letter was handed over to the Army Postal Service to go back to England. “How ridiculous; what chance was there of me being able to hear the request even if the BBC decided to transmit it. “Across India I went mainly by train via Mhow, Chindwarrah – where we celebrated VE Day – then to Calcutta and finally to a big Army transit camp at Comilla around early July 1945. “In our mess-room was an old mains wireless set which wouldn’t work, but being in the Royal Corps of Signals, my colleagues expected me to repair it. “So I took the back off, found two loose wires, twisted them together, put the back on, plugged in, switched on, and lo and behold, we heard some sounds. “A bit of knob twiddling got All India Radio and a few other stations, then a day or so later we managed to identify the BBC Overseas Programme. “By an absolute coincidence – and this is true – we picked up an Overseas Forces Request programme. Halfway through this broadcast I was astounded to hear my name, and my record request was played: it was Opus 1/2 by the Benny Goodman Trio. Les’ service in the Far East was not over when the war ended – he spent virtually all of 1946 on Singapore, half of it in an abandoned rubber plantation and the other half over the road from the notorious Changi Gaol. Les re-joined Leicester Royal Infirmary and remained in the new NHS for rest of his working life, moving to Bromsgrove in February 1965 when he became a Supplies Officer in the Bromsgrove & Redditch Health Authority. In his final six years before retirement, he was a member of the Commissioning Team at the Alexandra Hospital. Having also lived in Northfield and Telford, he finally took up residence in Lickey End in 2004. 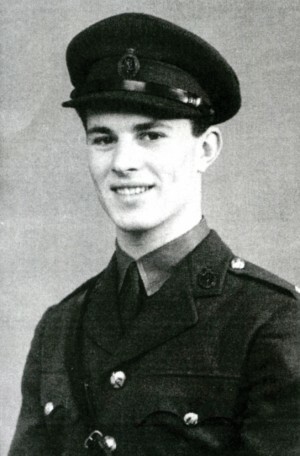 The photo was taken a few days after Les was commissioned into the Royal Corps of Signals in January 1945.